Have you ever been out birding and wished you brought your scope? Just down the shore of the lake there may be a lifebird, but your 8x or 10x binoculars can't quite make out its ID. Meet the new Celestron Hummingbird 7-22x50 ED Micro Spotting Scope, a tiny scope that will fit easily in a cargo pocket. It zooms to a maximum of 22 power, more than enough to reach out and make that ID. Many birders find most of the time they use their 20-60x scope at 20 power anyway. The Hummingbird also zooms down to 7 power. At that magnification, you can easily hand hold it. It has an angled eyepiece, which means you can look up high in a tree for a long time without getting warbler neck. The 7-22x Hummingbird scope weighs just 19 ounces, less than many binoculars. It's under 8 iches long and easily fits in a cargo pocket. It even fit in Michael's loose jeans pocket. But it delivers sharp images for its size and weight. But don't I still need a tripod to use it at 22 power? It's not absolutely necessary, but it sometimes helps. 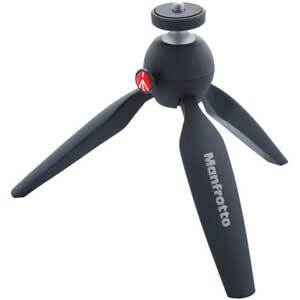 That's why we offer an option to buy it with a Manfroto Pocket Tripod. It attaches in seconds. Set it up on a rock, a log, or a park bench, for long, steady comfortable viewing at higher powers. The legs on the Pixi fold together and make a comfortable handle for hand holding. With the scope supported this way, its image is steadier than with a binocular. The Hummingbird has ED glass. It's made by Celestron, one of the top names in astronomical optics. It has a big, easy-to-use eyepiece and a relatively wide field of view. It works fine with glasses. Of course, a scope this small cannot be expected to out perform a high-end, full-sized scope (like the one you left home). But it has good resolution and provides an excellent viewing experience. When you zoom in or out, you will have to re-focus, as is true to some extent with many scopes. However, if having it with you means you are able to identify a bird, you probably will be willing to do that. Here you see the size of the Hummingbird (left) compared to two other small 50mm scopes, the Nikon Fieldscope ED50, and the Vortex Razor 50mm. If you want something that you can stick in a pocket, the Celestron Hummingbird is the champ. There is also a bigger version Hummingbird, which is a 9-27x56. It weighs 20.8 ounces. You get a little more magnification, but you may give up being able to slip it your pocket. It comes with larger tabletop tripod. The Hummingbird is affordable. Even if you already own a good scope, this micro scope plus the Pixi will fill a missing gap in your toolkit, without breaking the bank. It can also double as a loaner optic for a friend to carry who hasn't got a binocular. Field of view at 7x: 266 ft. @ 1000 yds. Field of view at 22x: 117 ft. @ 1000 yds. This is the smallest good 50mm scope we have ever seen. We think it fills a real need and that many birders will enjoy it. Copyright 2016 Michael and Diane Porter.